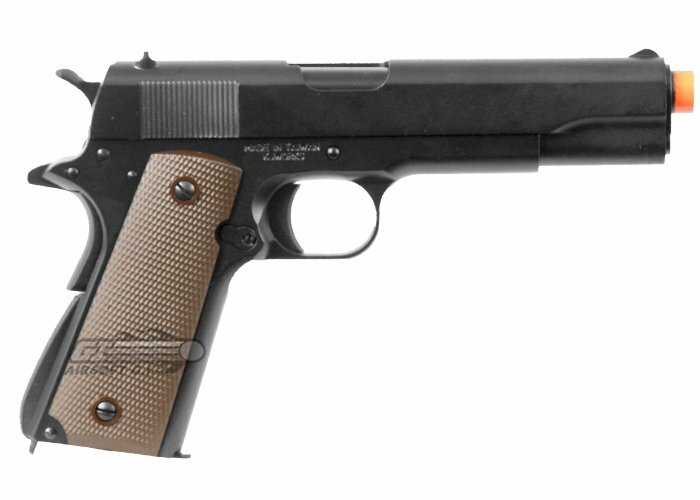 The KJW M1911 Single Stack is essentially a copy of the Tokyo Marui M1911, but with a metal slide, barrel, and frame. 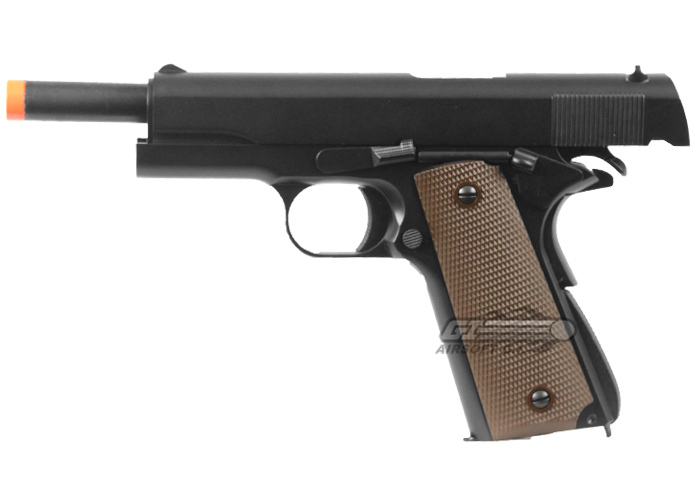 The grip safety and slide safety function and the break down procedure is similar to the authentic M1911. An attachment point for a retention lanyard has been included to prevent the loss of the gun during high activity. 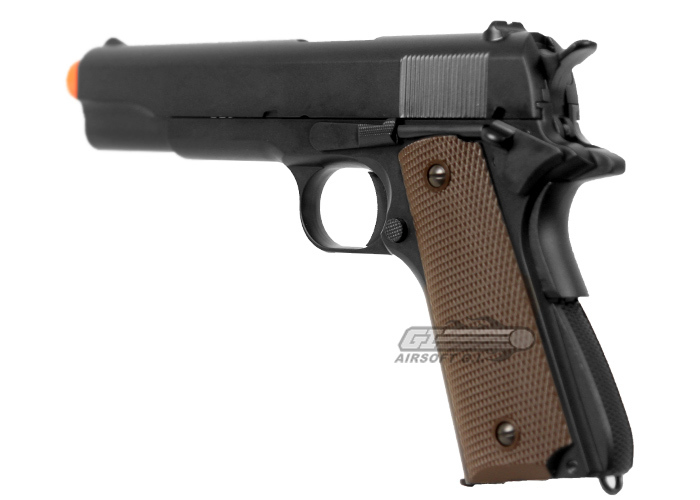 This is another great replica of the gun that served America well for many years. 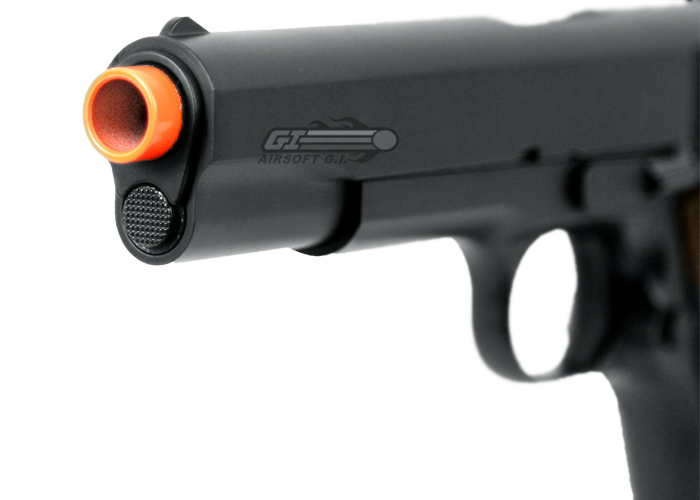 This gas pistol may be compatible with Tokyo Marui parts and upgrades but they cannot be guaranteed by Airsoft GI. Bought this back in '09 and it is still chuggin' along! It doesn't work with the CO2 mag very well (slide will lock up and jam on the slide catch every single time). It's weighty and classic and WOAH! 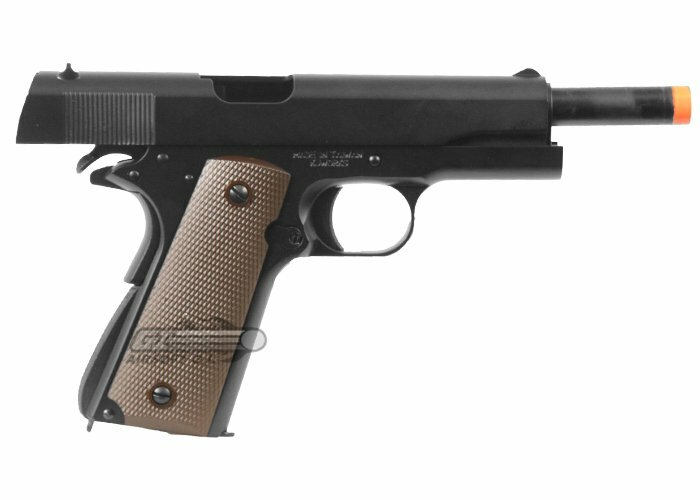 it's a 1911! (no kidding). 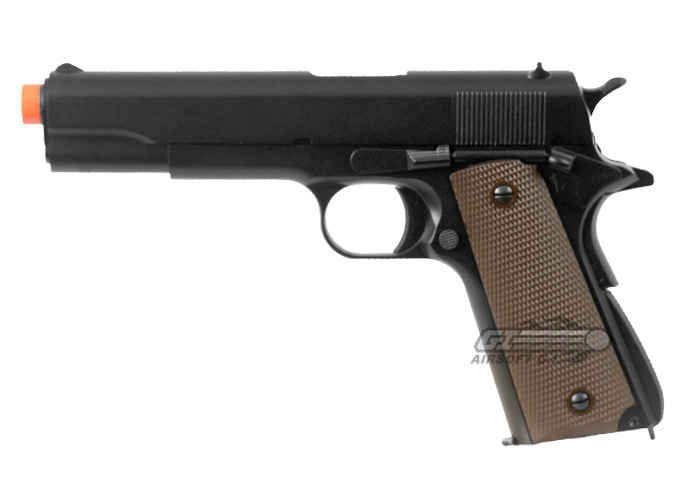 The grips are plastic and the rest is metal and the orange tip is non-removable and the sights are those 'classic' GI style and the 'mainspring' housing is rounded and the trigger is short and all that A1 'greatness'. But hey, it works, it still shoots straight for me goin' on 5 years now. The ultra-heavy slide kicks harder than most! Safety is nice and positive. the CO2 mag makes my gun lock up every time. For the price, just get yourself a WE and be done with it. This is my first GBB purchase - I've only had the chance to fire this in 40 degree weather, so performance will be decreased. I was able to get about 8 rounds on a full charge, but hopefully once the weather warms up that will increase. I can't say much about kick-back or CO2 because I've only shot three in my lifetime, but I love the metal finish and the weight. If you power with propane, just be sure to grab a can of Silicone gun oil with it. Spray some in the tip of the propane can then re-attach the adapter and charge. Do that about every 2-3 charges. Propane doesn't have the silicone additive that Green Gas does. (It's also readily available at Dunhams, Cabelas, etc and cheaper.) It's also recommended to disassemble and lubricate after each use. Basically lube anything that moves, and anything that's metal-on-metal, and use a rod to clean the barrel, all using the silicone gun oil. That'll prevent any future lock-ups and decrease wear, even with CO2. I rate this 4/5 due to the high gas-use. 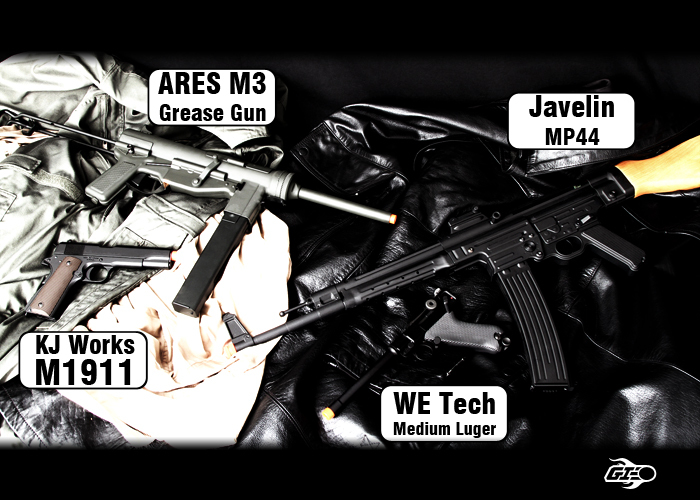 Other than that this is a great starter for anyone looking to get into GBB guns. Just gotta maintain and store it properly and you'll get a good long life out of it. 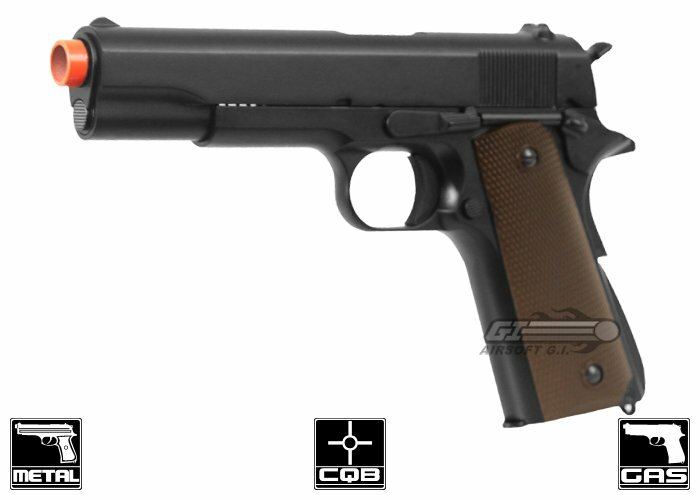 Amazing weight and feel to it, Comes with a manual,pistol itself and 1 mag and a small box of bb's. This gun does use a single stack slim magazine but infact it is a double stack. Eats gas like hell but you still get 9 shots so as a single stack guess you can be happy with that. 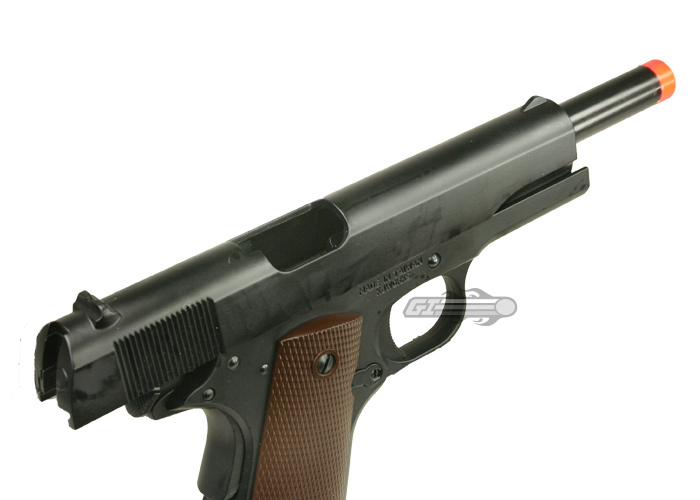 Can you put a mock suppressor on this gun? is this gun compatible with TM extended mags? I was wondering (because I don't like reloading) if this gun could take TM extended mag... plus the cool factor... so help would be appreciated. No, it is only compatible with KJW magazines.